The Montreal Metro is a nice way to travel, but sometimes you need a car to get around town. That’s where our car loan service can help: we connect Montreal drivers with a broad network of dealers who specialize in bad credit auto loans. Get a loan in Montreal even with bad credit or no credit. We only share your application info with the dealer. Loans start at $5,000 and can go as high as $40,000. We offer market-competitive interest rates. I have bad credit. Is it still possible to get a car loan through your site? Yes. We work with all Montreal drivers, regardless of their credit score. Just fill out our application form to kick off your loan approval (we don’t even need your social insurance number). Are all of the dealerships in your network located downtown? No. The dealers in our network operate across Montreal, so matching you with a car loan partner nearby won't be a problem. Whether you’re in Dorval or Anjou, Mont-Royal or Beaconsfield, we’ll help you get a car loan. How much tax do I have to pay on a vehicle purchased in Montreal? Montreal drivers pay two separate taxes: GST (Goods and Services Tax), and QST (Quebec Sales Tax). These two taxes get calculated differently: if you’re buying from a registered dealer, you’ll have to pay 5% GST on the purchase price, and 9.975% QST on either the purchase price or the estimated value of the car — whichever amount is greater. Is the manufacturer’s warranty still valid on a used car? Yes. In Montreal, the manufacturer’s warranty gets transferred to the vehicle’s new owner. Car loan payments are based on a variety of factors. The amount you’re borrowing and the interest rate both help determine your payment, as does the length of your loan. Remember that the longer you stretch out your car loan, the lower your monthly payments will be. Take care though: longer loans also mean you’ll pay more interest. 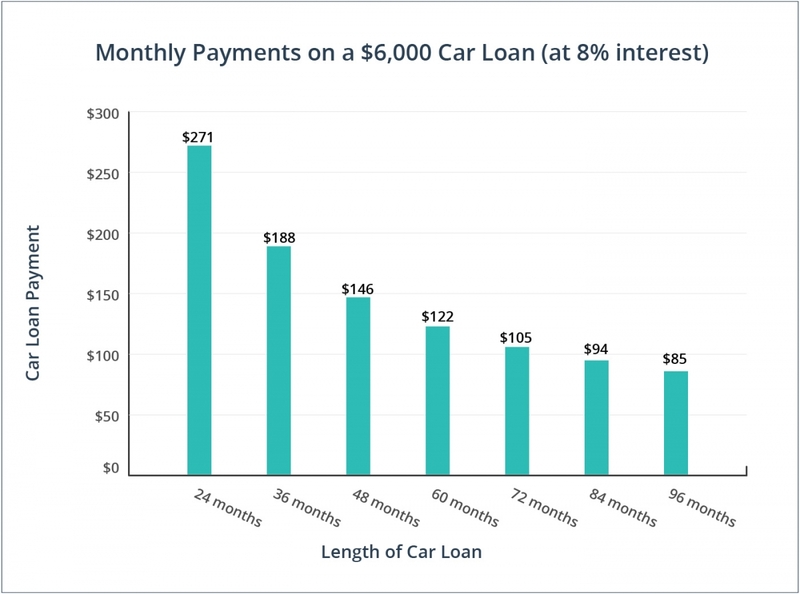 Take a look at our graph below to see what your payments might look like for a $6,000 car loan at 8% interest over different lengths of time. Registered car dealers in Montreal (and the rest of Quebec) have to follow wide-ranging provincial regulations that protect buyers and facilitate a smooth and transparent sale. Taking a short car loan will save you money on interest. Then you can spend more of your hard-earned dollars on the things that you enjoy doing in Montreal. Getting a vehicle history is easy in Montreal. Just request an official vehicle record from the SAAQ (la Société de l'assurance automobile du Quebec) and find out if the vehicle has had repairs, how many kms it’s been driven, etc. Drive the car for at least 30 minutes and get a feel for how it steers, brakes, and accelerates. And see how it performs at highway speeds. AutoRoute 10 and AutoRoute 20 are both good roads for testing a car’s performance at 100 km/hr. Interest rates on car loans are higher in Montreal (and the rest of Quebec) than in other parts of Canada. False. Auto loan rates are not meaningfully higher in Montreal than they are in other major Canadian cities. I have 10 days to return my used car to get a full refund. False. There’s no government-mandated return policy on used cars in Montreal. Make sure you’re certain about a vehicle before you buy it. If I have bad credit, the interest rate on my car loan will be sky-high. False. While it’s true that borrowers with bad credit pay more than borrowers with great credit, the rates on our car loans are market-competitive. You’ll also get the terms of your loan before you get to the dealership. It’s difficult to get a car loan for a used car in Montreal. False. Montreal has hundreds of used car dealers and many offer auto financing. According to the Royal Canadian Geographic Society, Montreal gains an astounding 390,000 people each work day as commuters head into the city to get to their jobs. The average commute time in Montreal clocks in at 36 minutes. If you’re driving in Montreal, you’ll probably see a Fiat. The diminutive Italian vehicles are wildly popular in the city. Quebec accounts for 43% of all Fiats sold in Canada, and many of them are purchased by Montrealers. Montreal’s biggest road construction project in decades is kicking into high-gear in 2016. The Turcot Interchange is being rebuilt from the Bonaventure Expressway all the way to Dorval Circle. If you’re driving through this part of town, expect frequent road closures and lots of detours. The 3-billion dollar project is expected to finish sometime around 2020.